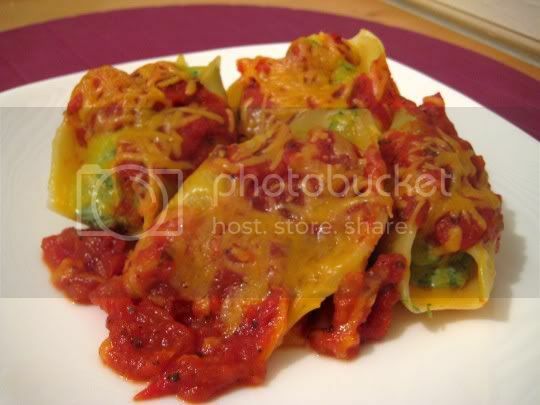 Fun and relatively easy to make, these stuffed pasta shells are hearty, satisfying, and quite tasty! Jumbo shells are cooked al dente, and then stuffed with an...unusual filling. Instead of the standard ricotta cheese used for filling shells, this version uses tofu...making this a wonderful feast for vegans, and anyone else with an open mind. Extra-firm tofu (best used for texture) is pureed with onions, garlic, spinach, and fresh basil, which will create a smooth, thick, bright green filling. The basil and garlic are really pronounced flavors, and the tofu seems to help boost the savoriness and spice. Olive oil helps to smooth out the filling and add to the creamy texture, and oregano adds a wonderful herbal, spicy, Italian flavor. Spoon the filling into a big ziploc bag, cut off the tip of one end (similar to cake piping), and squeeze an ample amount into each cooked shell...then carefully place into a sauce-lined pan. When all 16 shells are filled, spoon marinara sauce over them, and bake for 20 minutes. So simple! I used real (not vegan) cheddar cheese to sprinkle over these, as I can't quite get with the taste of soy cheeses. Still, these were delicious and leftovers were great! Make again? Yes, when I'm in the mood for a healthy Italian dish.